12 Apr 2018 --- Driven by a consumer demand for health and wellness products, astaxanthin is experiencing huge growth in the European market as well as booming demand in Asia. During a NutritionInsight webinar is entitled “Performance and Recovery: Natural Astaxanthin Opportunities,” Maryanne Mburu, Key Account Manager at AstaReal, and Dr. Mark Miller explored the product development and untapped opportunity for the health ingredient. 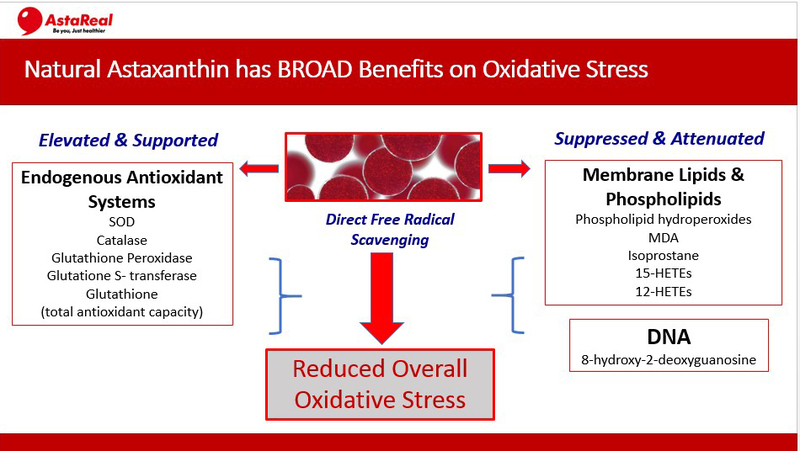 Click to EnlargeAstaxanthin has benefits on oxidative stress and can help boost cellular energy production by effectively protecting the membrane system of mitochondria. “There’s a lot of interest in the mitochondria as a driver for health, wellness, and the flipside, disease prevention. The reason is that mitochondria can generate a lot of free radicals in the act of generating energy. And there is ample evidence now that in disease states free-radicals can leak out of the mitochondria into the cells and they can drive a whole slew of other reactions from oxidative stress because of that leakiness,” says Miller. “The second element is that mitochondria have a lot of membranes, which increases the surface area to generate ATP [adenosine triphosphate] because the enzymes that generated ATP are embedded on the surface of each membrane. As astaxanthin forms these trans-membrane bridges, [it can help] to control free-radicals in the membrane and therefore functionality. The combination of potency and its chemical structure being aligned to the structure of the membrane makes it an absolutely superb mitochondrial nutrient,” he notes. Although astaxanthin appeals to range of categories, one key area of current interest for its use is the sports nutrition market, especially since clean label and taste are becoming key concerns. 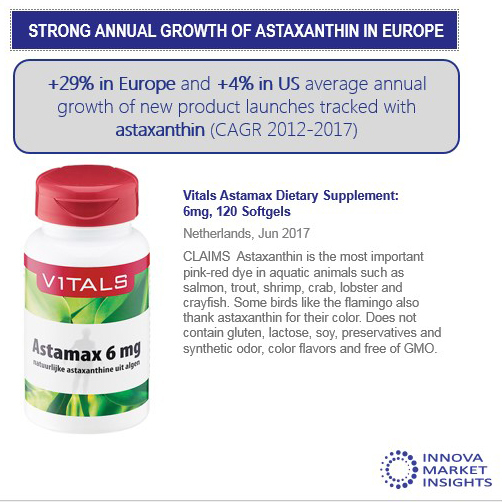 Strong annual growth of +29 percent has been reported for new product launches tracked with astaxanthin from 2012-2017, compared to 4 percent in the US. “Overall health & wellness remains the fastest growing claim for astaxanthin on +38 percent when looking at CAGR percentages for 2012-2017 for the fastest growing health claims. This is ahead of immune health on +33 percent and brain-mood health on +25 percent. So there are many platforms for innovation here, including sports nutrition,” Robin Wyers, Editor-in-chief at the World of Food Ingredients noted during the webinar. In 2017, 90 percent of all new product launches tracked with astaxanthin were in the supplements space, with the other 10 percent falling within the strict sports nutrition space. However, many of these supplements do feature some sort of lifestyle performance marketing angle. Based on the growing body of evidence regarding its benefits as well as the growth in product launches, astaxanthin may well become a foundational sports nutrient in 2018.